Remember to dress up as a book character this Friday 20 May (or if you wish to come in international costume that is fine too), please bring your book to carry with you on the parade. Prizes for best costumes. Parents are welcome to watch as the parade will start about 9.10am. There are lots of great costume ideas on the internet and our judges appreciate home-made efforts just as much! 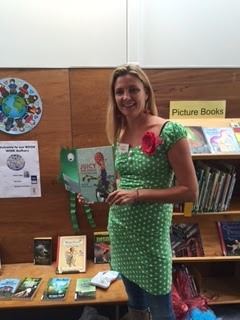 The Year 1 and 2 students had a wonderful visit with author Anna Theed who talked about being brave, popcorn, wind (!) and other tips for writing stories. She also gave every visitor a bag of Sweet As Popcorn to enjoy. If you would like to purchase a copy of Anna's book "Juicy the Peach and the Popcorn Palaver ($29.99) please email me on KatrinaW@parnell.school.nz. 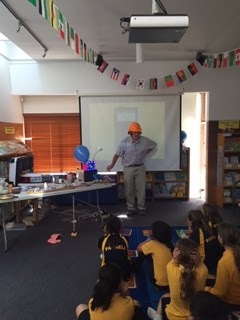 Our Year 5 and 6 students (together with some lucky Intermediates) have been entranced by author Des Hunt today. We've had burning steel, nuclear fusion machines, ray guns and other exciting experiments showing us how science can be incorporated into fiction and what makes a great story. If you want to read quality New Zealand fiction with science themes/details, try a Des Hunt book especially his latest "Cool Nukes". This year our Book Week theme is "Around the World with Stories" and we are lucky to have the following authors coming to visit us during the week. Melinda has written a number of picture and chapter books for children. Her book "The Were Nana" is particularly popular in our library. She will be talking with our Year Three and Four Students. Last week when Stuff published 50 books every kid should read by age 12 (http://www.stuff.co.nz/life-style/parenting/big-kids/79367223/50-books-every-kid-should-read-by-age-12), we started talking about NZ books we loved as kids, and NZ books that the kids in our lives love. We’ve compiled a (very subjective) list of 50 NZ books we think every kiwi kid should read before they’re 12. We’re not making any high claims of this being THE list. (What even is THE list?) This is just a selection of books we’ve been talking about in the office lately – more of a jumping off point to start a conversation about what NZ books us kiwis think are important for our kids. We’d really love to hear your thoughts! Tell us in the comments below what NZ books you think every kiwi kid should read before they are 12. Margaret Mahy, Joy Cowley and Maurice Gee are the holy trinity when it comes to NZ children’s authors. There was much bickering in the office trying to agree the best book by each author. In the end, we gave up. Our recommendation is for everyone to read ALL of their books – they’re the holy trinity for a reason! Okay, we also bent the rules and gave Donovan two books – they’re equally amazing and we have so many nieces/nephews/cousins who are obsessed with these two classics! We recently surveyed our member schools, and found that this series is the most taught NZ book in schools for 2016.